My office contains the display of several Native American artifacts. Often people ask me "Why the Native American material?" Natural question, I suppose, since not many people think much about the subject or the people to whom we owe so much. The ongoing discussion about sports mascots, especially in professional sports and particularly in the NFL with the Washington franchise, offers a reminder and the space to at least acknowledge the issues surrounding native peoples who were dispossessed, largely by my ancestors. I collect and display the Native American items as a reminder to everyone that oppression, injustice, fear, hatred, racism and notions of ethnic superiority run through our national narrative from start to present. A people with our history should practice humility and exercise sensitivity far beyond what comes natural for most of us. The New York Times published an editorial today by Yale professor, Ned Blackhawk ("Remember the Sand Creek Massacre") that brings much more focus and seriousness to the tragic story of Native Americans and the invasion of their homelands. MANY people think of the Civil War and America’s Indian wars as distinct subjects, one following the other. But those who study the Sand Creek Massacre know different. On Nov. 29, 1864, as Union armies fought through Virginia and Georgia, Col. John Chivington led some 700 cavalry troops in an unprovoked attack on peaceful Cheyenne and Arapaho villagers at Sand Creek in Colorado. They murdered nearly 200 women, children and older men. Read the entire essay here. HANDING a homeless alcoholic the keys to a free furnished flat may seem foolish, unfair or both. 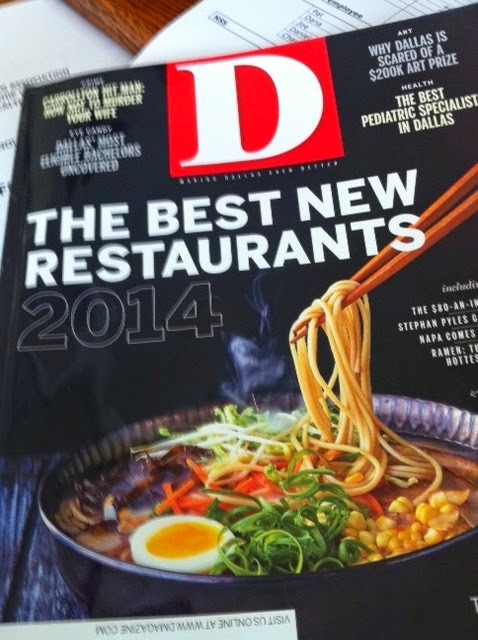 The title caught my eye right off: "Sinking City" (DMagazine, December 2014, page 26. "Dallas is a top 10 city for affluent residents, says a new study. Overall wealth went up 23.8% between 2012 and 2013." Been here before--most of the year digging into the facts of life in Dallas as a part of my assignment with the Mayor's Task Force on Poverty. This sort of data is exactly what got our Mayor engaged, concerned and determined to work on the amazing challenges at the other end of our community's economic continuum. The Dallas Morning News reported that Dallas was "leading in the growth of high-net-worth individuals and wealth." 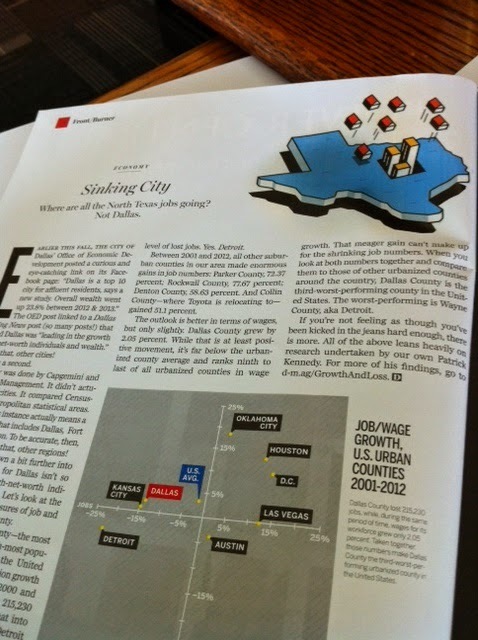 But, if you move away from the top and focus on jobs and wages for Dallas County, things don't seem so encouraging. As a metropolitan statistical area, Dallas is the fourth largest in the nation. Dallas County is part of this 13-county region, and is the largest of the counties. Our region grew by 1.2 million people between 2000 and 2010. At the same time, Dallas County lost 215,230 jobs. The article points out a shocking truth: to lose that many jobs makes Dallas County almost a Detroit-type economic environment. During the same timeframe, surrounding counties posted big jobs gains: Parker (+72%), Rockwall (78%), Denton (59%), Collin (51%). Wages in Dallas County rose by just a shade above 2%, or 9th from last among U. S. "urbanized counties." Get this: on jobs and wages, Dallas County is the 3rd worst performing county in the nation. Any idea which U. S. county is the worst performing on jobs and wages? Wayne County, Michigan, home of Detroit. Dallas, we have a problem. I just read your article on Facebook concerning the homeless and the mentally ill. . . .I live on the poverty level and am mentally ill. I have Bipolar Disorder with Mania and Depression. I was a school teacher for 20 years in Lancaster, DeSoto and then Dallas ISD. Because teaching 6, 7 and 8th graders are so challenging and dealing with the Standardized test, my PA suggested I retire on disability. I did. I then worked in retail for 7 years in a declining market. 3 of the 5 stores I worked for closed their doors. I haven't worked in 4 years. However, I do have a interview with Nordstrom on Wednesday and maybe I can start getting back on my feet again. I lost my car due to an accident and now take the bus. It is going to be very challenging to take the bus, especially late into the night. However, I am going to try my hardest to accomplish this goal. With my little Teacher Retirement, I bring home $1,200 a month. I cannot live on this. I have to work. I eat so many sandwiches and crackers it is not even funny. I also take 6 medications to relieve my Bipolar Disorder and Anxiety. Because I am not on Medicare or Medicaid, I make these co-pays myself. What has strengthened me more through all of this is my everlasting relationship I have found with God. I no longer worry about my future like I use to, but it is very difficult and unnerving to say the least. I find myself on the streets riding the bus talking to all kinds of homeless people. Most of them have a mental illness, most are very bright, and have at one time been successful. I too, could follow in this footstep of not having a roof over my head. The rent, water, electricity keep going up and my check stays the same. It is very difficult to maintain any sense of normalcy due to my illness. What I have found, is through my experience, I am able to filter a lot of the mental illness kind of like a schizophrenic not listening to voices. I think there is so much more American's can do to help the homeless. I was very proud to have read your article tonight. Right now I am not able to help the homeless or mentally ill, however, in my prayers tonight, I will pray that I may be able to help in the future. Thank you so much for your article that softens my heart concerning the homeless and mentally ill. I may not be able to put my heater on as high as I would like, but right now I do have a roof over my head. Thank you again for such a touching article. According to a new study from the Robert Wood Johnson Foundation and Urban Institute, Texas stands to lose $100 billion over the next decade if it sticks to Governor Perry's promise not to expand Medicaid with federal funds made available to the state. Expanding Medicaid would cost the state something under $6 million, a comparatively meagre investment. 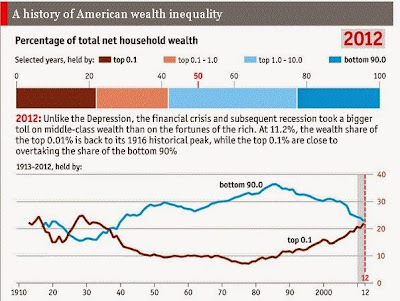 Refusing the expansion makes no sense whatsoever in economic terms. All the talk about Medicaid got me to thinking. Expanding the low-income health insurance product in Texas faces another fundamental challenge: even if expanded, there aren't nearly enough doctors in the state who will accept Medicaid patients due to the low reimbursement rates defined by the program, among other reservations associated with treating the very poor. Given the stalemate, I'm wondering if Medicaid expansion funds could be used for other efforts to improve community health outcomes among the poor and marginalized? Already, some states are using these funds to invest in decent, affordable housing for the homeless. Housing has been identified as a determinant of health, and therefore worthy of use of these funds. Reports on this innovative approach have been written by our friends at the Corporation for Supportive Housing (www.csh.org). Today, I'm imagining using Medicaid funds to incentivize grocery stores to move into low-income, marginalized communities. Why couldn't Medicaid funding be used to wipe out "food deserts" so prevalent in our inner cities in this nation? I haven't figured out the business model yet, but it would include several factors. On-going reimbursement or "value added" supplemental income, if needed, that could be indexed to the pounds of produce sold in the stores. Company marketing would produce ad campaigns for fresh foods to drive these on-going income supplements. Ultimately, the benefit and cost savings would be realized via better public health outcomes in neighborhoods that today are "hot spots" for chronic disease sets like hypertension, diabetes and obesity. Just thinking out loud while billions of Texas funds remain on the shelf in D. C.! CitySquare WorkPaths has plans to move toward mid-skill development and living wage jobs. Watch the following report and then share your reactions. Homeless people are human beings. As such, they must find restroom facilities. They must satisfy their hunger. They must identify places where they can sit and rest periodically. And, just like me, they need at least a modest amount of capital to survive, even if hand to mouth. Most of my friends, who experience life today without a place to call home, face tough odds when it comes to landing a job. Earning money is a huge challenge when your home base is an emergency, night shelter or worse, the hard, mean streets. The countless day-to-day details and challenges of poverty this deep exhaust my capacity to comprehend. Like all human beings homeless people make mistakes. By comparison, the mistakes I make seem to be much more forgiving than the missteps of a person so poor that they have no place to call home. The social safety net beneath my feet is so strong and woven so tightly that my missteps don’t affect me for very long. Such is not the case with my very poor friends who need a place to live. Recently, during a Dallas City Council Quality of Life Committee meeting, we heard harsh words about some of our weakest neighbors from more than one elected official. Frustration over “panhandlers” escalated to the extreme counsel that the city needed to get tough on people who beg for money on our streets. “Break their backs break their spirit — that’s the only way we’re going to win this battle,” one city council member demanded of police. Referencing the negative impact the presence of beggars had on business interests in his district and extremely frustrated, this otherwise, sensible, measured member of city leadership erupted in anger. Homelessness frustrates everyone who knows anything about, including and most especially those who live in its terrible grip. I would suggest that the person I meet on the street who begs for pocket change or a meal already has had his/her spirit broken at least to some extent. I also know that the remedy to the frustrating reality of people begging on our streets will not be found by throwing folks in jail. First, we need aggressive, stepped up outreach to chronically homeless persons who live on our streets. The goal would be to assess vulnerability and to secure every available benefit for this segment of our community, including disability income, health care, SNAP (food stamps), shelter and ultimately permanent supportive housing. This will require political will, an increase in public funding, and additional case workers from the public and non-profit sectors who willingly work together to deliver relief and hope. The return on such investment for everyone would be substantial. Second, we must realize that our jails can no longer be allowed to serve as the public mental health system for the poorest people among us. Adequate funding for our mental health system would dramatically improve the “quality of life” all of us experience on our streets. We’re paying today for three decades of under-investment in these vital services. Third, we must develop hundreds of additional units of permanent supportive housing for those who live in shelters and/or on the streets of our city. No matter how effectively we may intervene in the lives of people so poor that they are forced to beg on our streets, without real housing we will not achieve the outcomes we all desire. Homelessness frustrates everyone who knows anything about it. Business owners and merchants, law enforcement personnel, homeowners in crossroads neighborhoods, drivers stopped at traffic lights at busy, urban intersections, couples out for an evening downtown—all share concern and some aggravation at the presence of homeless persons who beg for assistance. However, none are more frustrated than those who know homelessness as a personal, defining experience and reality. Rather than breaking human backs and human spirits, the better approach would involve us in straightening and strengthening backs and restoring spirits as a community distinguished by its radical care for all of its members. When CitySquare calls its new facility an opportunity center, it’s not kidding. The CitySquare Opportunity Center will offer low-income residents of Fair Park, South Dallas and East Dallas job training, food distribution, a wellness center and a community cafe. AmeriCorps, Work Force Solutions of Greater Dallas, LIFT, Per Scholas and CitySquare’s WorkPaths will have offices there. CitySquare raised $15 million to build the 52,000-square-foot facility, which is easily accessed by DART. NBC reports on the Opportunity Center! We've been through the process several times now. It never gets easier. Thursday we are set to open our new Opportunity Center. We really aren't ready to open, but we decided two months ago that this Thursday would be the day. Two of our three partners are operational. We need to get moved in, and we will make it. But, it's not been easy. The project itself has been a challenge. Thanks to so many private donors, we've been able to construct a very funky, urban cool structure at one of the major gateways to South Dallas-Fair Park. From the beginning we were committed to developing a first class community center that would gather resources and partners to deliver a collective impact on one of the poorest areas of Dallas. When you work among "the poor," folks who possess limited material resources, you have to make peace with changes in vision even in mid-stream! I've signed off on multiple change orders, all of which seemed justifiable at the time, given the circumstances. What I do know for certain is that we care for people consigned to lives in "the surround" of poverty. In fact, it's not too much to say that we love them. They are our friends, our neighbors, people who are worth our highest and best efforts and resources. The "poor" are our very best partners and they are experts on the subject of poverty. And, I know our new center will make a huge, transformative difference in the lives of the people who enter its doors. That certainty makes all the uncertainty and difficulty seem very, very small indeed. Earl Shorris speaks of "the surround" of life experienced by persons who live in low-income families, communities and realities (see Riches for the Poor: The Clement Course in the Humanities). In "the surround" of poverty, people scratch and struggle and fight to survive in ways that the majority of the non-poor population cannot begin to understand. In such a social and personal context, space for calm thought comes at a premium and is exceptional, if it comes at all. People in "the surround" of poverty spend most of their energy, effort and strength managing the chaos that fills their lives. Not long ago, I sat in a circle of a dozen men. The group was part of a workforce training program designed to train and employ under-skilled, unemployed, ex-incarcerated men. As part of the Monday morning "wake up" exercise, the leader asked each person share what kind of weekend they had enjoyed. Going around the circle, we heard how things had been since Friday. As I listened, a couple of things struck me. First, every man who spoke told us what they had had to eat over the weekend. Some went into great detail in describing how well or how poorly they had eaten. Clearly, this was a group of men who had known hunger and want. Their appreciation for a good meal pressed me hard, as I realized how thoughtless I am about how freely I eat and how I seldom miss a meal. Second, a few of the men described really traumatic situations that they had been in or near over their weekend. One told of gang type fights he had observed and escaped as quickly as possible. Another man after telling us of his meal, reported that his brother had been shot and seriously wounded. He feared that his brother might be paralyzed due to the injury. After sharing this troubling news, he pivoted quickly to talk about a football game he had enjoyed watching. The juxtaposition of delight and agony and his ability to slide from one side of life to the other made me think of Shorris's notion of life in an unmanageable "surround" thrust on people by poverty. Working among, living near and loving "the poor" calls for new wisdom that must involve a new commitment to listening carefully, speaking less and displaying an honest, unknowing humility.